It was with great sadness that in January 2017 we received news that Keith Williamson had passed away. Keith had a long and distinguished career in the wrestling business and was highly thought of by his fellow professionals although was more well known to the wrestling fan as Keith Martinelli, the no nonsense wrestler who was one of the hardest men in the game. Keith Williamson was born on 21st April 1936 in Bolton and always had a passion for the wrestling business. At 15 years of age Keith joined the Bolton Amateur Wrestling Club where he, like many others, spent many hours learning the business before swapping the amateur mats for the bright lights of the professional ring aged 18, in 1954. 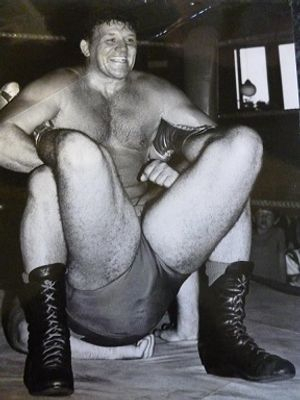 Keiths first bout was against Bomber Bates, a well known wrestler in the North of England, who gave him the name “Autro” Martinelli, but he soon adjusted this to Keith Martinelli, a name that would stay with him for his entire wrestling career. As Keiths wrestling career progressed he became a very skillful middleweight who faced many of the top stars the business had to offer at the time. Keith was a relentless opponent for anyone he opposed and was soon known in the business as “Bloodboots” such was his style with many of his colleagues commenting that if you had a bout with Keith when you returned to the dressing room you were in a far worse state that when you left it to go to the ring. Keith was on the first show at the newly built Wrestling Stadium at Butlins Bognor Regis in 1960 and continued to travel around the holiday camps for many years entertaining literally thousands of not only die hard wrestling fans but many holidaymakers. Keith wrestled for many of the promoters in the business at the time appearing on ITVs World of Sport and Reslo S4C Welsh Television for legendary Promoter Orig Williams. After a successful in ring career in which Keith travelled literally thousands of miles he retired in 1991 at the age of 55 years of age. During his career Keith also did a lot of work for promoters as a sign writer, painting up ring skirts, corner posts ring vans and stadiums all over the country. After his retirement from the ring Keith continued with his out of ring work for many years from his workshop in Bolton. During the last few years of his life Keith struggled with his mobility, desperately needing both new hip joints, and having debilitating cellulitis, which sadly led to sepsis and organ failure resulting in his death on 24th January 2017 at the age of 80 years in Bolton Royal Infirmary. Keith leaves five children. Steven, Vanessa, Keith, Justine and Keira and many grandchildren. Keith was one of the great legends of British wrestling and has certainly left his legacy, he was highly respected by his colleagues with many of them attending his funeral including Mark Rocco who flew in especially from his home in Tenerife to pay his respects. Keith will always be remembered as one of the best by the wrestling fraternity, his name will live on and now that his suffering is over may he RIP.